In 1 987, the museum took delivery of a steel-bodied insulated milk car built in June 1935 for the Erie Railroad. While it looks like a standard steel refrigerator car of the period, this type of car was equipped with high-speed friction bearing trucks, a pass-through steam heat line, and a train signal air line to allow it to be hauled in regular passenger consists. Milk was once a lucrative traffic for the railroads, and the Erie played an important role bringing in fresh product from the farms of the Upper Delaware Valley to the dairies in the New York City metropolitan area. Passenger trains had faster, more predictable schedules than freight trains, and milk was a perishable commodity that had to get to the city as quickly as possible. 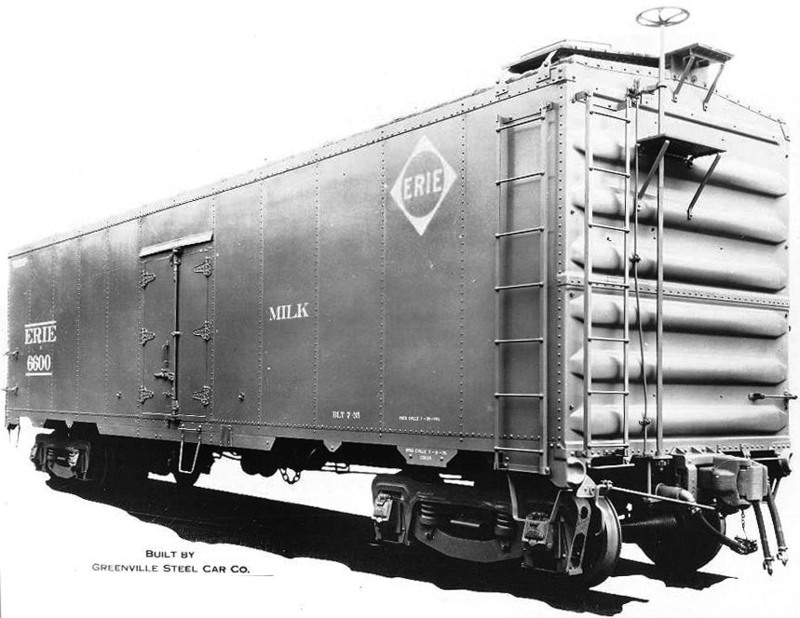 According to Larry DeYoung’s Erie Lacakwanna Color Guide to Freight and Passenger Equipment, milk cars like ours were built in 1935 by Greenville Steel Car Co. One of fifty-five unique milk cars built for the Erie, the series was numbered 6600-6654. Equipped with Buckeye ends, second-hand cast steel trucks, and refrigerator doors, these cars were insulated to carry milk in the traditional method, in cans gathered along the line. It was a fading technology even as the Erie was buying the cars, and fifty were converted to inside sliding doors, making them useful as express freight cars as well. A few survived in headend service long enough to get EL lettering (some even got gray, maroon and yellow paint). In fact the EL list of equipment for 1963 still shows 93 of the final 100 Erie milk cars still in service, six other having been sold to the Boston & Maine in the mid-fifties. Erie 6603 was used as a milk car into the late 1950s, when milk traffic had largely shifted to tanker trucks. The car was refitted with an inside sliding door and was then used to move express shipments and other head-end traffic. 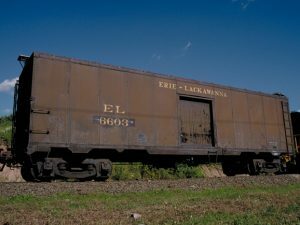 In 1960, the Erie merged with the Delaware, Lackawanna & Western to form Erie Lackawanna, and our milk car continued to soldier on as a storage car for maintenance of way crews. It continued in this capacity when most of the EL property was conveyed to Conrail in April 1976. By 1987, the car was deemed surplus and put on the market. It was purchased by museum member Ted Miller and donated to the museum. Of note, this car is equipped with an older style vertical hand brake wheel at one end of the car. Our milk car wears the same paint applied by Erie Lackawanna in 1960. It is currently used for material storage, though part of our display track in the Upper Yard. Built 1935 by Greenville Steel Car Co.